The artist I’m going to write about today is one of the greatest live acts I have ever been privileged to witness. Twice I have been lucky enough to witness him live in concert, each time he was brilliant, producing a masterful performance. One of the concerts I was at, was when he was touring the album this article is about. On that night, he produced a performance that turned back time. He played some of his classics, and much of this album. Everyone present, was enthralled by his brilliance, his piano playing and singing were of the highest standard. The second time I saw him in concert, he was even better. My advice is, if you ever get a chance to see Dr John in concert, you must go, you’ll not be disappointed. Anutha Zone is the album this article is about, released in 1998. Before telling you about this brilliant album, I will briefly tell you about Dr John’s life and career. He was born Malcolm John “Mac” Rebennack jr, in November 1940. His music is a combination of various types of music. Blues, jazz, zydeco, boogie-woogie, rock and roll and even pop. Starting out as a session musician towards the end of the 1950s, he was originally a guitarist, who also played piano. Fame didn’t come either quickly, or easily for him. It was only in the early 1970s’, that he came to the public’s attention. He drew inspiration from medicine shows and Mardi Gras, and his stage shows were spectacular, containing outlandish costumes and voodoo ceremonies. Some of his best work was released between 1968 and 1974 on Atco records. His debut album Gris-Gris, is a classic album, one that shows Dr John at the peak of his powers. It contains voodoo rhythms and chants, and stays true to the musical tradition of New Orleans. So highly regarded is the album, that it is in Rolling Stone magazine’s top 500 albums. Three further seminal albums followed in a similar vein to Gris-Gris. Babylon in 1969, Remedies in 1970 and The Sun, The Moon and The Herbs in 1971. All are albums that I would highly recommend as a snapshot of Dr John’s earliest work. To me, these albums are among his best ever. Gumbo was released in 1972. It contained many songs that were important in New Orleans music. Like its predecessors, it contains some wonderful music, and Dr John’s interpretation of this music, is among his finest work. It has been described by many as psychedelic voodoo music. Indeed, he wouldn’t explore the psychedelic voodoo music until Anutha Zone, the album this article is about. After Gumbo Dr John decided to expand his musical horizons, and explore other musical styles. In 1973 he recorded In the Right Place, with Allen Touissaint and The Meters, analbum of New Orleans funk music. It’s another important album, one highly regarded by music critics. He followed this Desitively Bonnaroo, another album of New Orleans funk music. Again, it’s a highly regarded album, one filled with some wonderful music, showing Dr John at the peak of his powers. Dr John released three other albums in the 1970s’ the best of which was Hollywood Be Thy Name, released in 1975. It was nowhere near the standard of his other albums in the late 1960s and early 1970s. The 1980s were not the greatest period in Dr John’s career. My favorite album from that period is In A Sentimental Mood, released in 1989. On this album, he plays some old standards, and his voice and piano playing are brilliant. The 1990s were slightly kinder to Dr John. 1994 saw him release Television. Although still not a return to his earlier brilliance, the album contains some good music. By 1998, his glory days were long gone, a distant memory. He was still remembered fondly by people like myself, long term fans, who loved his music. Then in 1998, it was announced he’d recorded a new album, one which saw him collaborate with a number of “guest artists” and which was produced by John Leckie. Granted, guest artists were hardly musical heavyweights, but John Leckie was a highly respected and talented producer. Immediately I was interested. When the album was released, it was a pleasant surprise, Dr John had rolled back the years to produce a great album, one I well tell you more about shortly. After Anutha Zone, Dr John has released seven further albums between 2000 and 2010. They’re a mixed bunch. Some are good, very good and others not so good. The best are Duke Elegant in 2000, a tribute to Duke Ellington, where Dr John interprets some of his songs. Creole Moon released in 2001, Mercernary a tribute to Johnny Mercer, which sees Dr John sing a number of Mercer’s songs and Tribal released in 2010, are the best albums he has released post Anutha Zone. The rest of the albums released in tis period all have some good music, but aren’t among his best work. 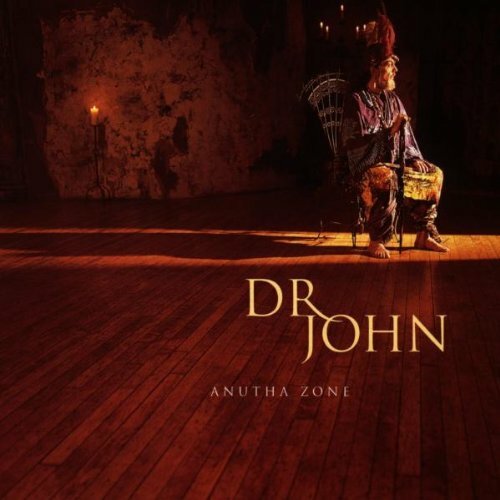 Having briefly told you about Dr John’s long and distinguished career, I will now tell you about Anutha Zone, a wonderful album. Anutha Zone sees Dr John return to the psychedelic voodoo music of Gumbo, so to get in the mood, draw the blinds, light some candles and burn some incense. The album opens with Zonata, what can only be described as a short musical interlude. Dr John warming up before the main event, he slowly plays some moody piano. Although only forty-six seconds, it’s forty-six magical seconds. Quickly, the mood becomes magical, a real slice of down home New Orleans. It’s funky, moody, Dr John’s vocal whispering, slightly eerily on Ki Ya Gris Gris. He has set the mood now. Percussion and congas, set the mood, guitars, drums all contribute towards the mood. What makes the track, is Dr John’s vocal, one minute whispering, eerily and moodily, sending shivers down your back, the next shrieking. Quite simply, this track is a moody, eery, slice of New Orleans. The tempo increases, and the mood changes with Voices In My Head. There still is an intensity with in the track. This track sees a guest appearance by Gaz Coombes, of Supergrass. Underwhelmed? I am. Voices In My Head is a real return to form by Dr John. His vocal is strong, clear, showing signs of his glory days. Behind him, his band are brilliant. They’re tight, a crack group of musicians. Drums provide a steady backdrop, and horns augment the sound, filling the space left by the vocal. Towards, the end of the track, the pace quickens, the sound intensifies, resulting in powerful track. Hello God sees Dr John half-speaking, half singing the lyrics. His voice is deep, gravelly and atmospheric. Perfect for this song. There is both an intensity and moodiness, within the track. So palpable it is, you can almost sense it. At the start of the song, the drums are slow and spacey, in keeping with the half-spoken mercurial vocal. The song is a dichotomy. It veers between darkness and light. On this track, The London Gospel Community Choir provide backing vocals. This results in a big sound, one that compliments Dr John’s vocal, and brings the song to life. Their role is of huge importance, and provide the light to the earlier darkness of the track. John Gris begins with distant drums, a flute playing, and a return to his psychedelic voodoo music of yesteryear. Straight away, the atmosphere is sinister, otherworldly and glorious. It’s a trip down memory for long term fans. One that brings to mind Mardi Gras, spine-tingling experiences and New Orleans at its most outlandish. His whispered vocal, adds to the atmosphere, as does the melange of musical instruments, including birambao, percussion, horns, flute, drums and droning backing vocals. Quite simply, an otherworldly musical experience with no equal. One of the album’s best tracks is Party Hellfire. Making a guest appearance on guitar and vocal is Paul Weller. From the opening bars of the piano you realize that you’re in for a musical treat. What follows is just under five minutes of brilliant piano playing and singing by the Dr. The lyrics are among the best on the album. It is a track that is almost flawless. Every musician produces a brilliant performance, and Carleen Anderson deserves credit for her backing vocals. My only quibble is Paul Weller’s backing vocals. They don’t blend in well with the rest of the backing vocalist, tending to overpower the others. I get the impression he’s trying too hard in such exulted company. Don’t give up the day job Paul. Apart from that minor quibble, this is a masterful track. I Don’t Wanna Know, is a cover of an old John Martyn song. Apart from John Martyn’s version, this is one of the best versions. Dr John sings the song beautifully, singing the song straight, with no frills. He sings the song the way it was meant to be sung. The addition of a Hammond organ really fills the song out, adding character to it. Both the arrangement and production are of the highest standard. John Leckie’s production is of the highest standard on this album. Like the last track, Weller’s vocal tend to grate, and are not suited to the arrangement. That is my only criticism of this brilliant song. The title track Anutha Zone is the next track. After three great tracks, one after the other, this song has a lot to live up to. Sadly, it’s no equal to the previous three tracks. Although it’s a prime slice of funk, with Dr John’s piano playing of the highest standard, and his vocal good, the lyrics let the song down. Everything else is good, the arrangement and production, and the standard of musicianship. All that lets the song down, is slightly weak lyrics. Thankfully, I Like Ki Yoka, sees a return to the high standard of the rest of the album. The atmosphere is moody, moody with a capital M. From the start your taken on a journey, one that’s otherworldly, with a hint of the supernatural. A saxophone blows, setting the tone, afterwards Dr John whispers moodily, before singing. Drums, percussion and brass section provide a backdrop, with backing vocalists accompanying Dr John. Once the track ends, you feel relieved, yet privileged, to have heard such a great track. The mood doesn’t lighten any, with The Olive Tree. What changes is the lyrics. They’ve a spiritual theme. Straight away, Dr John keeps the moody, atmosphere up. It’s broody, dark almost heavy. His band join him in accomplishing this. Drums, percussion, congas and clarinet all set the mood. Dr John’s vocal matches this mood. His vocal is strong and dramatic, articulating the powerful lyrics. What he ends up with, is a strong track, one thats dark and moody. Soulful Warrior begins with an organ playing, its sombre. Then quickly, the mood changes, heading uptempo. The rhythms are joyous, catchy and infectious. However, the lyrics are dark and sad, touching on the futility of war and conflict. Dr John’s singing is among the best on this album. His voice is softer, not as loud, and is more melodic, than on other tracks. Both Dr John and is band are at one on this track, and have produced a great track. Dr John’s voice is at his darkest, moodiest best on The Stroke. His vocal is almost a growl, as if suppressing his anger and disgust. The lyrics match the darkness of his mood. Contributing to this atmosphere, is the backing band. Their performance meanders, moodily, full of darkness, occasionally, allowing the light to shine in. It’s a great track, one that will send shivers down your spine, and one you’ll never tire of hearing. Anutha Zone closes with Sweet Home New Orleans. It’s very much a case of after the dark, comes the light. After the darkness of The Stroke, comes the light of weet Home New Orleans. Although it starts slowly with piano and brass section playing, don’t be fooled, the Dr and his band are just warming up. Good things come to those who wait. That’s the case here, because soon, the track opens up, to become a great slice of New Orleans tinged funk. Dr John’s voice and piano playing are stunning, and behind him he is fortunate to have a wonderful group of musicians and backing singers. All of them come together to make this a fantastic end to a great album. Anutha Zone was a welcome return to form from one of my musical heroes. It was one of his best albums in a long time. During a career that now spans six decades, he has produced many masterful albums. Strangely enough, he is not an artist that is widely known. He is very much one of music’s best kept secrets. Many people call him a musician’s musician, like JJ Cale. It’s a pity that more people haven’t discovered this secret. On Amutha Zone, there are some wonderful songs, songs Dr John sings and plays piano brilliantly on. He’s backed by his usual wonderful band, as well as some “guest artists,” whose contribution to this album, is minimal in my opinion. Anyone who has read this article and is thinking about buying Anutha Zone, my message to them is go ahead, it’s a brilliant album, one that will immediately make you a fan of Dr John. There are numerous other albums of Dr John’s that are well worth buying. In fact, all the albums I have mentioned in this article are the basis for a collection of Dr John’s best albums. They will give you a snapshot of the best of his career. If you buy these albums, you’ll not go far wrong, and you’ll find yourself wondering why did I not discover Dr John sooner? Standout Tracks: John Gris, Party Hellfire, I Don’t Wanna Know and I Like Ki Yoka. ← BOB MARLEY AND THE WAILERS-EXODUS. John Martin wrote ‘I don’t want to know about evil’ not Skip Spence. Skip Spence is incapable of writing anything as good. I like Anutha Zone though and loved In a Sentimental Mood. Anutha Zone and In A Sentimental Mood are both great albums from Dr John. His version of John Martyn’s Don’t Want to Know is one of the best covers of the song. However, John Martyn’s version of Don’t Want to Know on his classic album Solid Air is still the best, and was always a favourite when he played live. If you like John Martyn, check out When The Day Is Done: The Orchestrations Of Robert Kirby. It’s a fantastic compilation, and features some wonderful music.